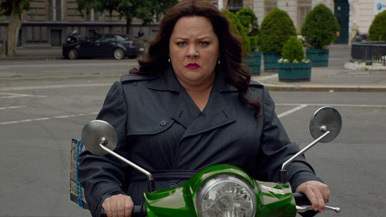 Kim Hollis: Spy, Melissa McCarthy's latest comedy collaboration with director Paul Feig, debuted with $29.1 million this weekend. What do you think of this result? Edwin Davies: I think this is fine, and well within McCarthy's wheelhouse as a solo performer. The stellar reviews and word-of-mouth had me hoping that the film would open closer to The Heat's $39.1 million, but then again that film had the advantage of co-starring Sandra Bullock and having a stronger trailer. The ads for Spy, while amusing, lacked a killer moment to really crystallize it as a must-see. While it's not as high as the film perhaps deserved, it's worth noting that McCarthy's audience tends not rush out on opening weekend. The Heat, despite opening to a pretty high number, still went on to earn nearly four times its opening weekend, as did Tammy, which went from being written off as a flop in its first weekend to being a solid earner by the end of its run. If Spy follows that pattern, it could still earn more than $100 million, which is a decent result for a film that cost $65 million. Also worth noting is the film's international performance. It has so far earned $56.5 million, and its status as an action comedy means that it should easily eclipse the $70.3 million The Heat earned, and maybe even Bridesmaids' $119.3 million. When all is said and done, I'd expect for this to be another solid result for Melissa McCarthy and Paul Feig.